In case you missed it here and at virtually every other publication in town, a Shake Shack will open in the Third Ward at 11 a.m. tomorrow (December 6). We’re not usually the type to go unjustifiably crazy when a national chain comes to the area, but since the location at 220 E. Buffalo St. will be the first Shake Shack in both Milwaukee and Wisconsin, as well as just the 96th location in general, we figured it warranted at least some attention. Plus they invited us, and who are we to turn down a chance to experience Shake Shack before Wednesday’s opening? Instead of simply feeding into the hype or reheating a press release, we made the most of our opportunity to visit the popular chain’s only local link by eating and drinking a bunch of stuff, then asking every conceivable question people might have about Milwaukee’s new Shake Shack. Shake Shack started renovations on its space on the high-traffic corner of Buffalo and Water streets in August. The site can accommodate 110 guests with a blend of window-side booths, traditional tables made from wood reclaimed from New York bowling lanes, and elevated counters. We’re told outdoor seating (complete with planters and water bowls for dogs) will be added next spring. Beyond soft drinks, cold brew coffee, and tea, Shake Shack will have red and white wine, and a variety of tap, canned, and bottled beers available. Spotted Cow will be the first local representative on the draft lines, which we’re told will rotate seasonally. The Milwaukee location is the only Shake Shack that offers Sprecher Root Beer. The chain’s other locations sell root beer from Louisiana-based Abita Brewery. Canned and bottled selections include MKE Brewing’s Outboard, Lakefront’s Riverwest Stein, Miller High Life, Juice Packets IPA from The Fermentorium (based in Cedarburg), Montucky, and Surly’s Xta Citra. The most intriguing pour is ShackMeister Ale, a light, classic draft beer that Brooklyn Brewery has made exclusively for Shake Shack since 2008. It makes for a solid pairing with a Shake Shack burger. The chain’s flagship burger, the ShackBurger, absolutely holds up to the hype. The thin and juicy slab of beef is topped with American cheese, fresh lettuce and tomatoes, and this addictive type of tangy mayo called ShackSauce that single-handedly takes the otherwise simple, well-executed burger to untold levels. We found Shake Shack’s surprising star to be its fries. Miraculously, they’re the same frozen crinkle fries Shake Shack used when it first opened in 2004. After a failed (and costly) attempt to switch the fresh-made fries, customers demanded en mass to switch back. They’re lightly crisped on the outside, soft inside, and both the saltiness and the scoop-suited crinkle cut make for some prime custard dipping. 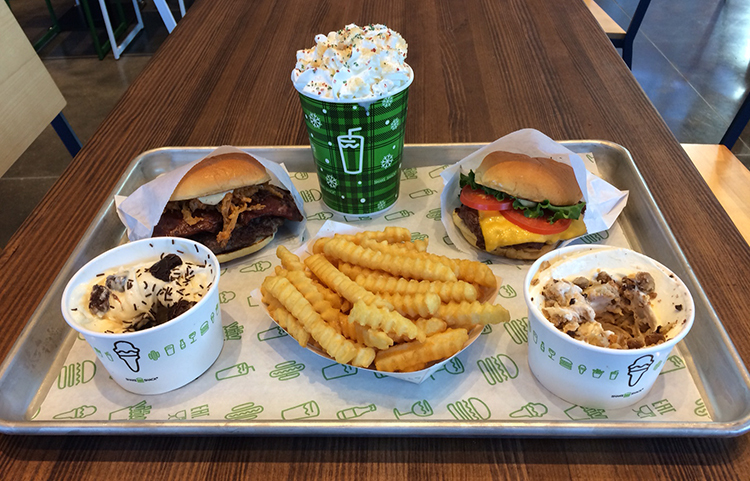 On top of the full menu available at all Shake Shacks (a sum that we’re told will top 100 locations by year’s end), Milwaukee is home to a handful of exclusive menu items. There’s a Brat Burger that utilizes a halved and fried Usinger’s jalapeno brat. The jalapeno brat takes center stage in the Shackmeister Cheddar Brat. Two desserts have local ties, too. The Buffalo Street Brownie relies on chunks of Rocket Baby Bakery brownies to elevate creamy vanilla custard and salted caramel sauce in one of Shake Shack’s “Concretes.” Another Concrete is the chain’s “Pie Oh My” initiative, wherein Shake Shack partners with a rotating cast of area pie makers for a charitable menu item that combines a pie and vanilla custard in a dish. Honeypie’s apple pie is the first seasonal pie to be featured. Groundwork Milwaukee will receive 5 percent of all Pie Oh My sales. So what else is there to say? Shake Shack is opening on December 6 at 11 a.m. The first 50 customers will get a free ShackBurger. You should probably get ready to hear people engaging in heated debates whether it’s better than Culver’s. That’s pretty much it. Now you know everything we do about Milwaukee’s new Shake Shack. Go…or don’t. Whatever.